After a high-profile tussle and one of the biggest team hires in the City, Sidley Austin has secured the corporate work of key Kirkland & Ellis client TowerBrook Capital Partners, amid claims that Sidley pushed aggressively to secure the work. 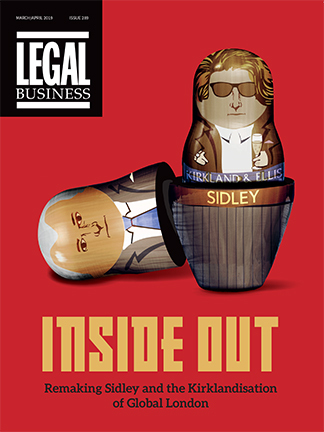 Tussle continues over lucrative work after K&E raid After a high-profile tussle and one of the biggest team hires in the City, Sidley Austin has secured the corporate work of key Kirkland & Ellis client TowerBrook Capital Partners, amid claims that Sidley pushed aggressively to secure the work. US firm returns to King & Wood Mallesons to staff Paris offering The first quarter of this year has proved slow for many private equity (PE) practices in Europe but this has not deterred Goodwin Procter from recruiting in France. Linklaters and Olswang have been called before a Parliamentary committee to answer questions over the sale and contentious administration of BHS. In a rare partner exit from Allen & Overy (A&O), the firm’s head of non-contentious financial services regulation Bob Penn has quit to join Cleary Gottlieb Steen & Hamilton in London. Sidley Austin has filled a hole in its City finance debt team with the hire of Willkie Farr & Gallagher corporate leveraged finance partner James Crooks. In line with what many dispute experts predicted, the Ministry of Justice (MoJ) has requested a cash injection after seeing a drop in court fee income. After four months of searching for the firm’s next global managing partner, Ashurst has turned to its Australian side and appointed Sydney-based banking partner and global finance co-head Paul Jenkins as the second man in charge.